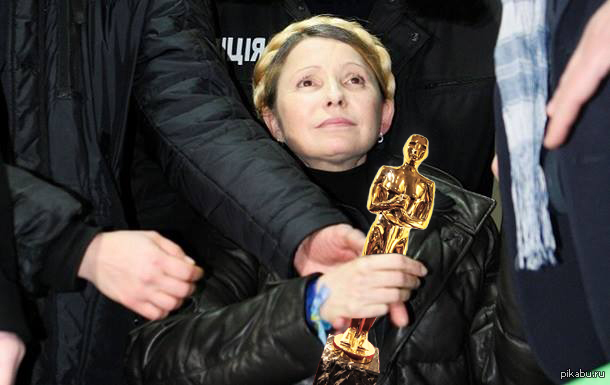 Photoshopped image of politician Yulia Timoshenko, recently released from jail by the opposition controlled Ukrainian parliament. Many view her as a strong candidate in the coming presidential elections. Anonymous image found online. Remarkably, it is now a fait accompli that the Ukrainian opposition has taken control of the country's political process. President Yanukovich's fall from power was in no small part due to the radical nationalists who made up the core of the street activists standing opposite Ukrainian riot police for the last three months. Nationalist parties like Svoboda, and radical organizations like the “Right Sector” (see this early YouTube video [ru] of Right Sector leader Yarosh talking about taking the fight to “Ukrainian” lands in Russia) contributed to the eventual victory of the Maidan movement, and now appear to be in a unique position to influence Ukrainian policy making. Тягнибок заявил, что русский язык на Украине будет объявлен вне закона. Ясно? Tyahnibok declared that the Russian language in Ukraine will be made illegal. Clear? Tyahnibok declared that Russians living in Ukraine will be made “non-citizens of Ukraine.” Clear? It doesn't matter if such policies will ever come to pass. The very thought of them scares nationalists who feel that Russian-speaking Ukrainians are also Russian. Судьба Януковича – великолепный урок всем мелким тиранам, предающим русских. Он мог бы сделать русский язык государственным и править опираясь на русскую половину, которая постепенно стала бы русским большинством. Он предпочел прямо противоположный путь. Yanukovich's fate is a great lesson for petty tyrants who betray Russians. He could have made the Russian language an official state language and rule relying on the Russian half of the country, which over time would become a Russian majority. He chose an exactly opposite approach. 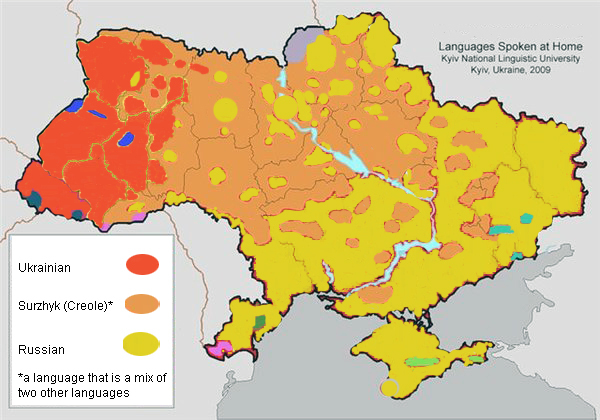 This language map by Kiev National Linguistic University shows the split between Russian speaking east and Ukrainian speaking west. In general, language appears to be a major point of contention for nationalists on both sides. In the past couple of days the new opposition controlled Rada has passed several laws, one of which was to repeal of an older law that gave Russian the status of a secondary official language in Ukraine. This led nationalist philosopher and founder of the National Democratic party Konstantin Krylov to proclaim [ru] the new regime “anti-Russian.” Krylov claims that such laws diminish political freedoms and Ukraine, and calls for new policy that would allow Ukrainians to easily acquire Russian citizenship, if they so choose. Можно себе представить, что было бы, если бы не было 1941 года, и существовали бы те, кого убили, и их потомки, – а Рада отменила бы идиш в качестве регионального языка. You can imagine what would happen, if there was no 1941, and all of those who had died and their descendants would now be alive – and the Rada took away the regional status of Yiddish. Truly, Russian nationalists are vehemently against any kind of ethnic discrimination — unless, of course, they get to be in charge.